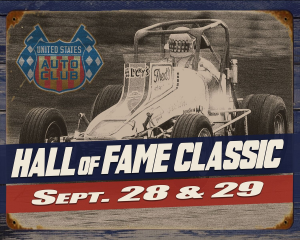 Arizona Speedway host the Hall of Fame Classic both Friday and Saturday, September 28/29, featuring the AMSOIL USAC/CRA 410 Sprint Car Series. Along with the stars of USAC/CRA, will be former stars receiving recognition from the Arizona Motorsport Hall of Fame with legendary racer Frank McDaniel serving as Grand Marshall. San Tan Ford 360 Sprints co headline with USAC/CRA and Winged Arizona Micro Sprints make their first Speedway appearance in six years. This will be the first time the popular USAC/CRA series has visited the Speedway as a stand alone show. Coming off a win in last weeks Glen Howard Classic at Perris Auto Speedway, Damion “The Demon” Gardner tightened the gap on points leader Brady Roa who finished second with Austin Williams in third. Roa, Gardner and Austin Williams are top 3 in points headed into the two-day event with Cody Williams and Max Adams rounding out the top 5. Local star R.J. Johnson who has competed in the series full time for 2018 sits seventh in points behind Jake Swanson. Arizona stars Charles Davis Jr, Tye “The Bull” Mihocko, “The Magic Man” Mike Martin and Matt Rossi are also bolting 410’s in for the weekend. With the strongest part of the schedule beginning now, the San Tan Ford Sprint Car Series has solidified themselves as a showcase division in 2018. With five wins in seven races, reigning champ Zach Madrid continues to lead Dustin Cormany, and Matt Lundy third. Entering the weekends event, the contingent carries a long list of teams capable of picking up their first win of the season. More series info at www.SanTanForddesertsprintcars.com . Arizona Micro Sprints will throw the wings on and run for the first time in 6 years around the high speed oval. Running for $500 to win with a 15 or more cars both nights, this division will be capable of setting the fastest laps of the weekend. Arizona Motorsports Hall of Fame Autograph session will be Saturday night from 5:00pm-7:00pm. Programs available at the front gate and t shirt booth for autograph session. Green flag flies both night at 7:00pm. Grandstands open at 4:30pm and pits opening at 2:00pm. Single day and Discounted 2-day advanced tickets are available at www.showclix.com/event/hall-of-fame-classic-friday-and-saturday-night until 1:00pm Friday, single show tickets are available at the door both Friday and Saturday day of the event both days. Pricing for this special event, Friday $20 all adults, Saturday $25 all adults, discounted 2-day tickets are available online only for $40. Pit passes $35 , kids 7-11 pit passes $20 and kids 6 and under free. Arizona Speedway is located within ET Motopark at 48700 N Ironwood Dr. San Tan Valley, AZ 85140 5 miles south of US60 on Ironwood Dr. Call the hotline or logon to www.ArizonaSpeedway.net for more info. 480-926-6688 . Follow us at www.Facebook.com/ArizonaSpeedway .